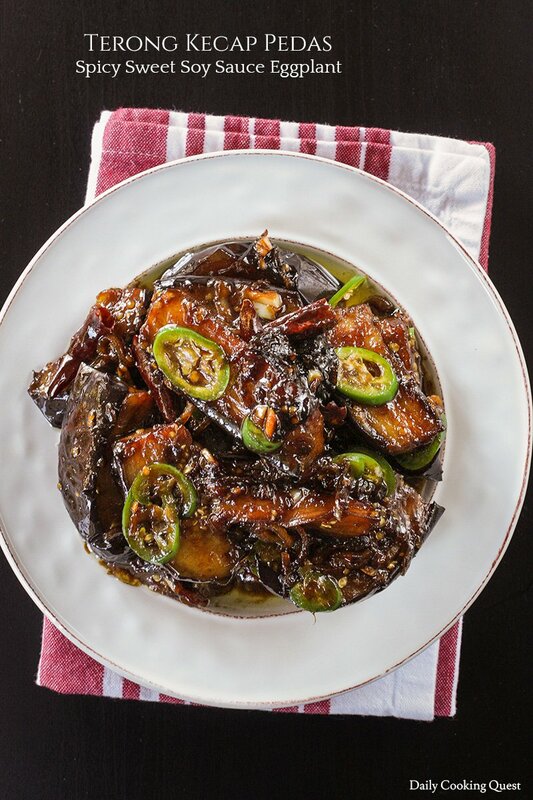 Eggplant is a very mild and bland vegetable, so I like to pair it with bold tasting sauce like Indonesian kecap manis and plenty of chilies. 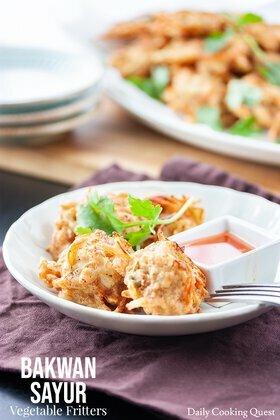 If you haven’t gotten to try Indonesian kecap manis, you are really missing out. Do yourself a favor and get one bottle already. 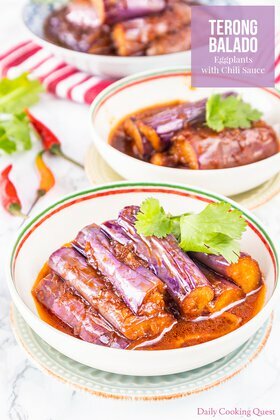 Once you do, give this terong kecap pedas - spicy sweet soy sauce eggplant recipe a try. 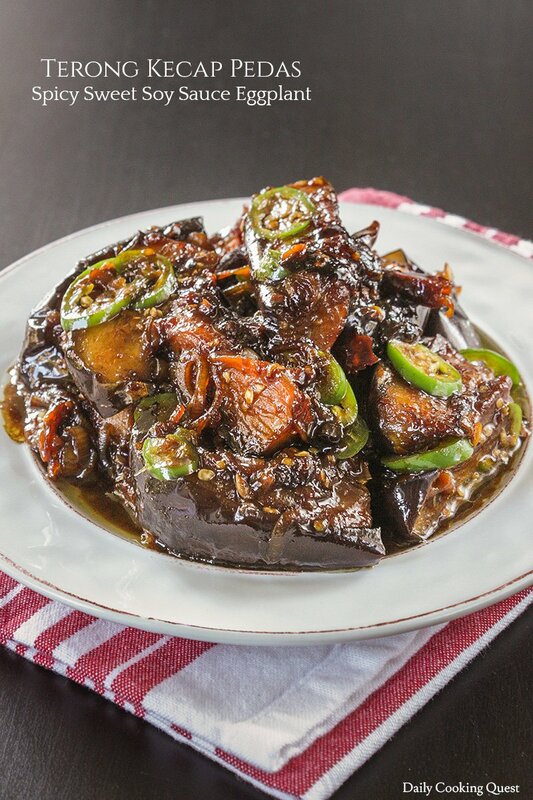 Typically, Indonesian use the thin lanky Chinese eggplant regularly available in Chinese grocery store. 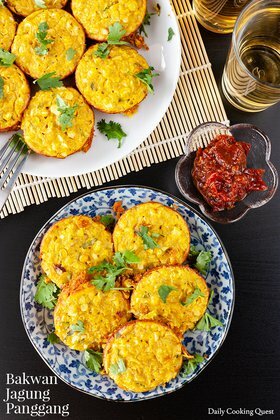 But if your home is far from any Asian grocery, you can use standard American eggplant too. In fact, I am using American eggplant in this very photo shoot :) They are pretty interchangeable, so no need to worry. Heat about 1 inch of oil in a frying pan. Once the oil is hot, fry the eggplant pieces in hot oil for 1 minute. Remove the eggplant from pan and set aside. Remove all the oil from the frying pan and leave about 3 tablespoon worth. Heat the oil again over medium high heat, sauté shallot, garlic, and dried red chilies until fragrant. Add salt, pepper, and kecap manis to the pan. Stir and bring to a boil. Return the eggplant to the frying pan, lower the heat to a medium low. Cook until the sauce is almost dry and absorbed by eggplant. Turn off the heat. Add thinly sliced serano/jalapeno, stir well, transfer to a serving plate and serve with steamed white rice. this doesnt say how much water? Hi Heather, you are right! There should be about 1/4 cup of water in the ingredient list, sorry for that. I have updated the recipe appropriately. Thank you so much for pointing that out to me. Excellent, that was my guess! 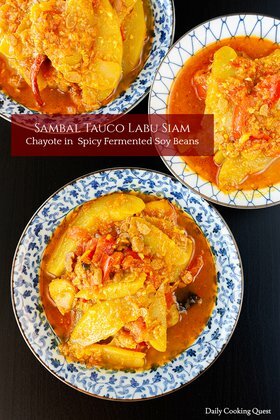 Family favourite by the way, we also use it adding Tempeh in addition to Aubergine, and that is absolutely delicious.